One of the Cézanne tours consists of a visit to Cézanne’s family home in the area known as the Jas de Bouffan, located in Cézanne’s day on the western outskirts of Aix and now part of the enlarged city. Unlike many of his contemporaries, Cézanne was the scion of a wealthy family. His father was a successful merchant and banker, and despite his great disappointment that his son decided to pursue art instead of finishing his legal studies, he nevertheless supported Cézanne financially. 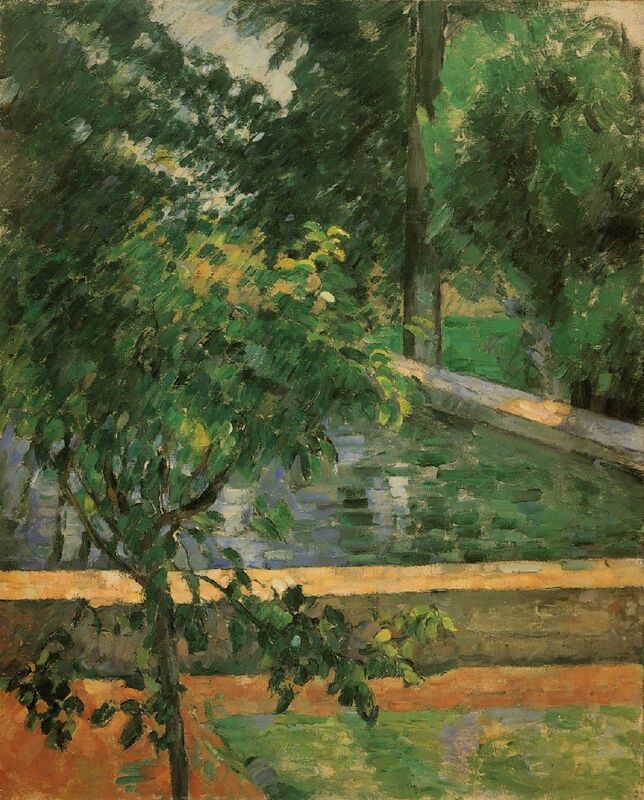 He purchased the house in the Jas de Bouffan in 1859, when Cézanne was 20 years old. The ground floor included a large drawing room with a curved white wall and a high ceiling. Cézanne began painting in this room in 1860, filling the walls with the products of his first efforts as an artist. After Cézanne’s death, the paintings were removed from the walls and transferred to canvases, but the tour of the house includes a video presentation that projects images of these paintings onto their original locations. At the urging of his friend and former schoolmate Émile Zola, Cézanne relocated to Paris in 1861, where he later came under the tutelage of the Impressionist master Camille Pissarro. Beginning in 1870, Cézanne moved frequently between Paris and Provence, including both Aix and L’Estaque, a fishing village located on the Mediterranean coast near Marseille. However, in the early 1880’s, Cézanne’s father had a studio built for him on an upper floor of the Jas de Bouffan. After that, Cézanne spent more of his time in Provence, at the Jas de Bouffan or at L’Estaque or other sites near Aix. 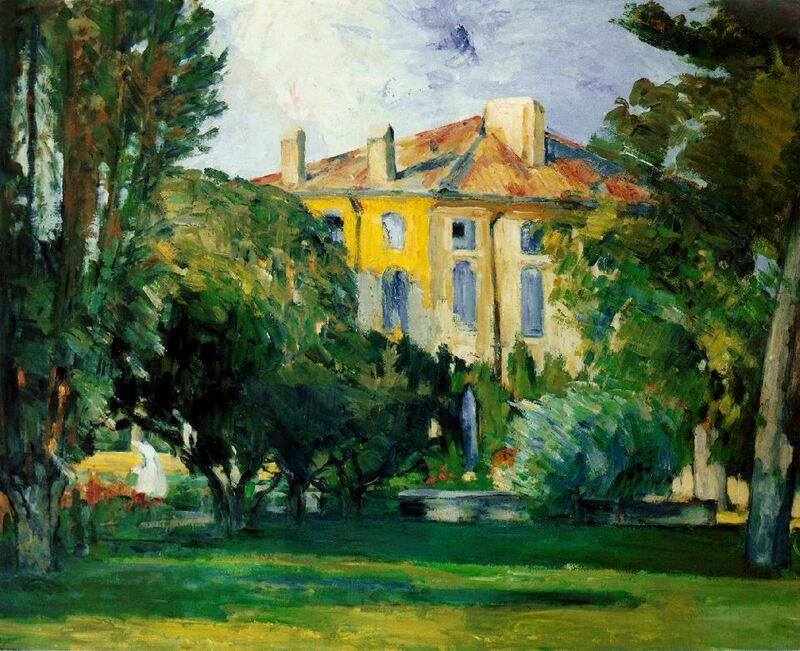 Cézanne’s father died in 1886, leaving Cézanne with a substantial fortune including the estate in the Jas de Bouffan. 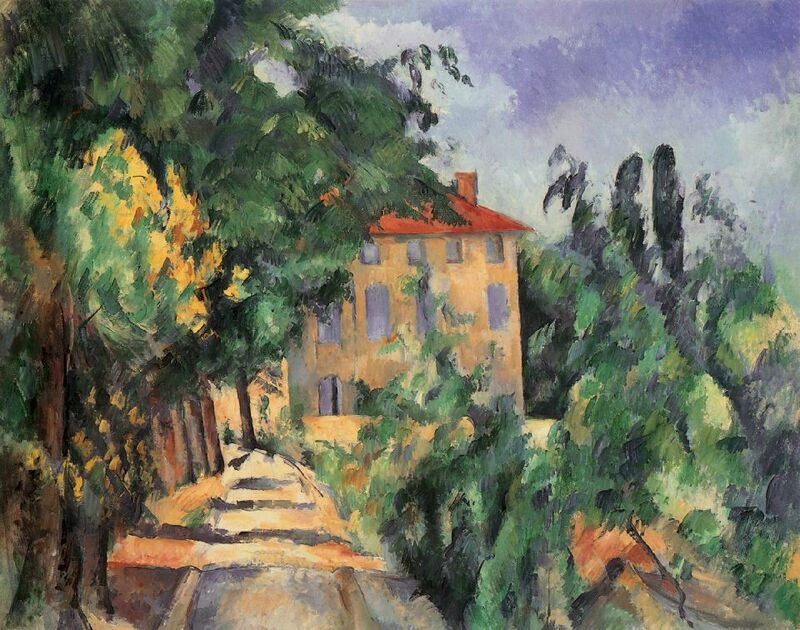 Cézanne lived and worked there at various times from then until 1899, when the house was sold following the death of Cézanne’s mother two years earlier. 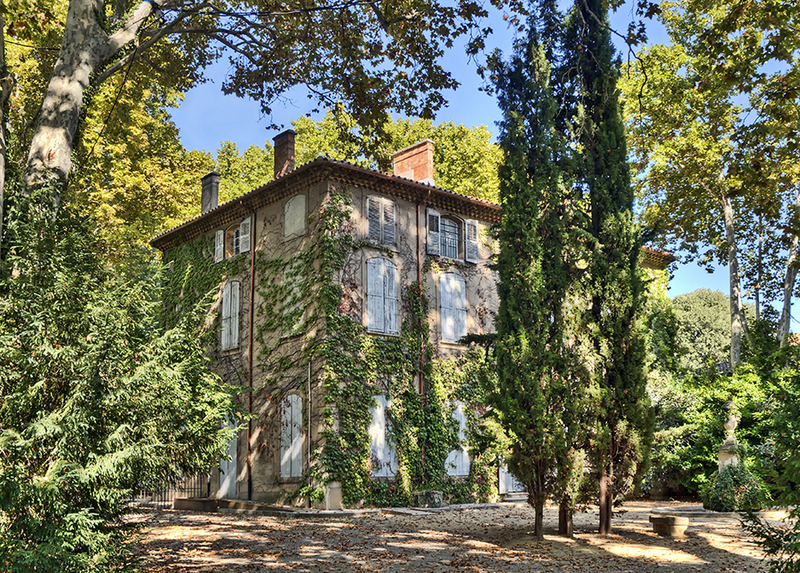 Much later, the house and a portion of the grounds were sold to the city of Aix. The house has been open to the public since 2006 for visits in connection with the tours organized by the Office de Tourisme. 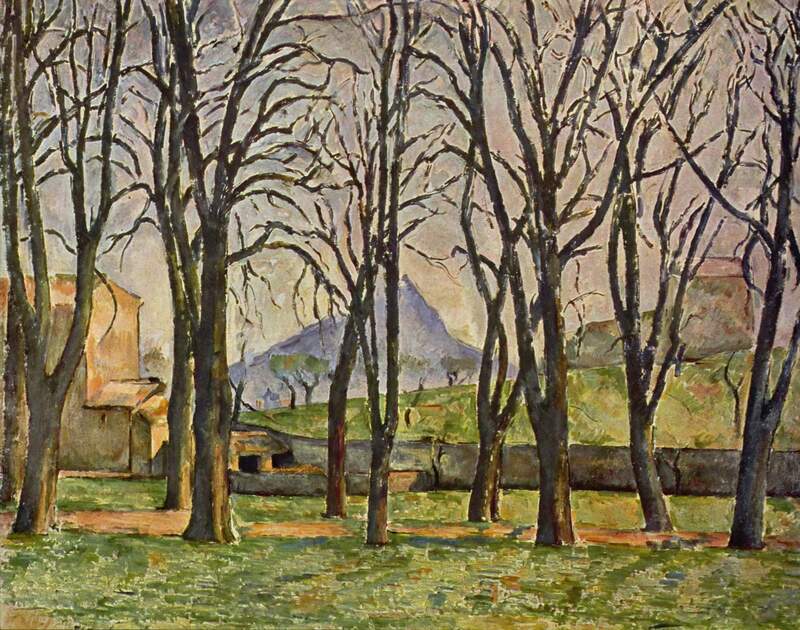 This photo may currently be seen at the recently opened Centre d’Art at the Hôtel de Caumont, in Aix-en-Provence, as part of an exhibition on the life of Cézanne. The first of these two paintings is a particularly good example of the distortion of perspective characteristic of much of Cézanne’s work. Although the point of view of the house in the painting seems to be about the same as the point of view in my photo, in the painting you can see a large part of the roof, as though the artist were looking down from a point well above the ground. The Mont Sainte-Victoire is a massive limestone mountain ridge lying just a few miles east of Aix-en-Provence, and was one of Cézanne’s favorite subjects. In fact, he created no less than 87 paintings of the mountain during his lifetime from a number of different of locations, including 44 oils and 43 watercolors. While I was disappointed not to have a view of the mountain from the Jas de Bouffan, I had a great number of opportunities to photograph it during my subsequent visits to sites in and around Aix. The second and third parts of the Cézanne tour included visits to Cézanne’s last studio at Les Lauves, just north of Aix, and to the Bibemus Quarries, east of Aix. Other posts in this blog describe these visits as well as my excursions to other sites in the vicinity of Aix from which Cézanne created his paintings of Mont Sainte-Victoire. 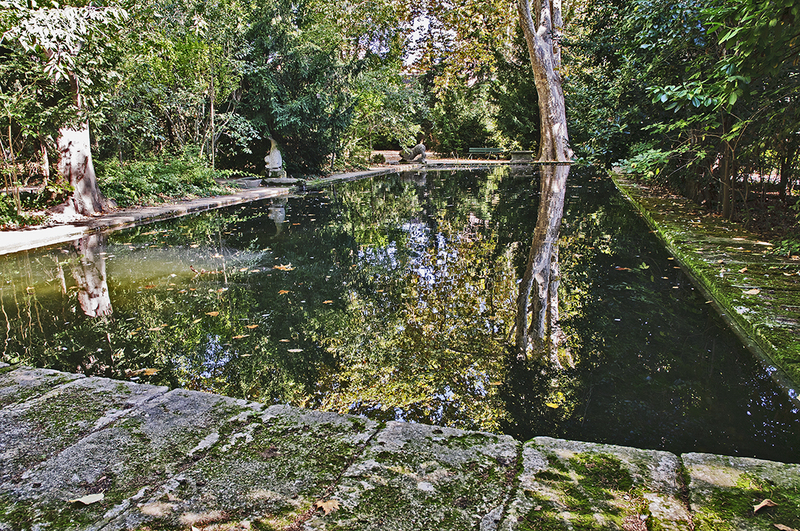 See In the Footsteps of Cézanne, Part II and In the Footsteps of Cézanne, Part III”. For other photos of Aix-en-Provence and other beautiful and interesting cities and villages in Provence and the Côte d’Azur, please visit the gallery Provence-Côte d’Azur on my photo website, Phil Haber Photography. For additional information about my photography, please see my photography Facebook page. Hi Phil – I was just looking up something like ‘in Cezanne’s footsteps’ and I came across your wonderful photos and stories to go with them….I shall look forward to hearing more about your visit to one of my absolute favourite cities in the world….la belle Aix….is it your first time in Provence and in Aix? If you need any hinters, re Provence let me know, I might just be able to help…. Hi Lis – I have recently published two more installments of “In the Footsteps of Cezanne,” which you might be interested in reading.